Moreton Bay fig tree is the hulk of all fig trees. Fig trees are known to grow large and very old, as old as centuries even. Compared to the banyan tree, Moreton Bay is the buff older brother. The Moreton Bay fig tree is found in many parts of the world. In some regions, it is relatively small, but in its full glory, it provides a sizeable shade. The Moreton Bay fig belongs to the 750 and more species of figs. Therefore, it has similar characteristics to the banyan tree. One of the prevalent features of figs tree is growing into a giant tree. Another is the fact that they are strangling trees that kill off their hosts. Before we explore Moreton Bay fig tree further, its scientific name is ficus macrophylla. For some reason, the macro in macrophylla probably alludes to the massive nature of the tree. Moreton Bay fig trees are available in Australia. While they aren’t be as large as others, they are a sight to behold. • The Moreton Bay fig tree seeds need a host to germinate. After its roots begin to grow, the tree strangles the host. 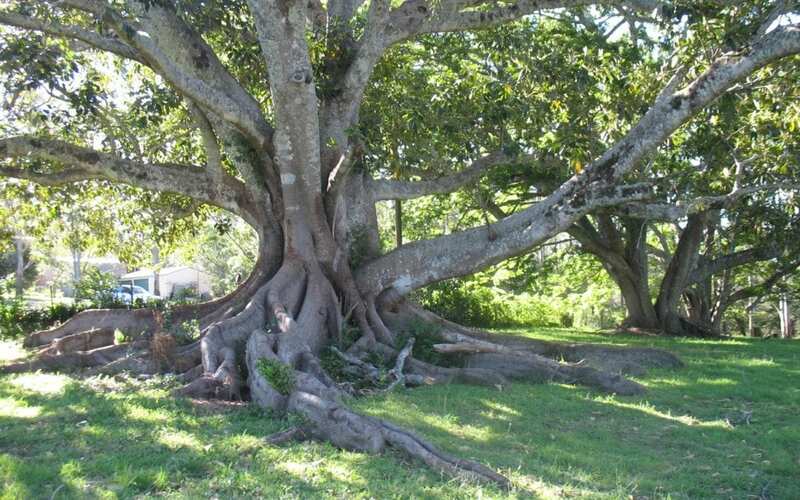 • Moreton Bay figs have buttress roots that often become large and form interesting shapes around the base of the tree. With that in mind, if you want to plant a Moreton Bay fig tree in your home, you should either have an extensive open area for the tree to express itself or plant it in a pot indeed. The problem with planting a Moreton Bay fig on the ground is that its roots hit the ground running. They are very wild and adventurous, and in no time, they’ll be in your house, causing damage to the street and sewer systems. Moreton Bay figs are no stranger to Australia. They are scattered around, and some can be found in Brisbane QLD. However, the largest Moreton Bay fig tree in Australia is located in Sydney in the botanic gardens. The tree is mostly a feature tree. It is 25meters high, and the distance around the tree is 15meters. In addition to this, the tree also forms a beautiful crown that extends 48meters. Despite these towering figures, this tree is not the largest Moreton Bay fig tree in the world. In Brisbane QLD, the largest Moreton Bay fig tree is a favorite spot for many residents to hold photo-shoots. To get better understand how huge Moreton Bay fig trees get, here are some of the largest Moreton Bay figs in the US.